Meet my daughter Yates and her BFF Ciara. 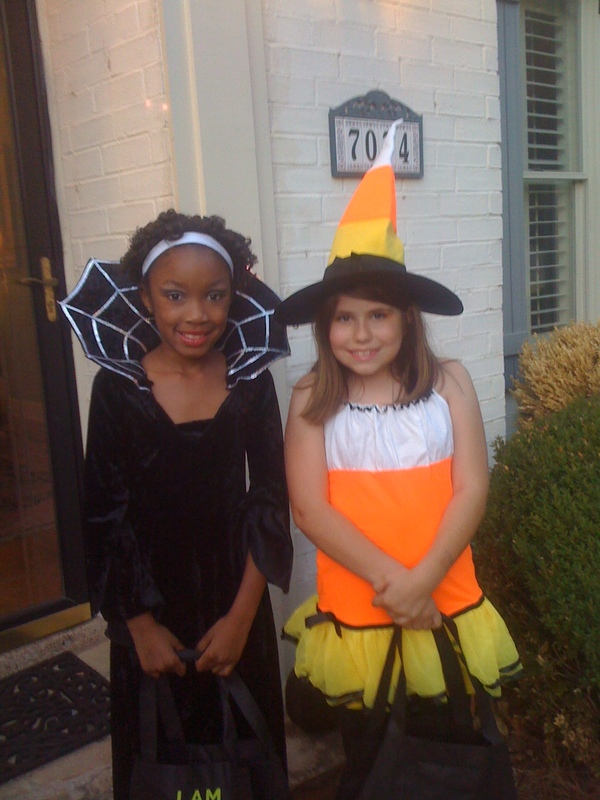 In this picture they are dressed up to go Trick or Treat last Halloween. Like most best friends, they spend the night at each other’s houses, they giggle at things this mom doesn’t get, they have cute catch phrases they say simultaneously and they finish each other’s sentences. They are 9 years old. As most 9 year olds, they have been taught in school all about Martin Luther King, Jr.’s life, but they do not understand how his death in the city of Memphis ripped this place apart. Nor should they. They deserve to live in a community that embraces them and all its children. Instead, they live in a community that created two school systems that represent the best and the worst of those who live in the city and those who live in the county. Of course, often one’s view of what is best depends on your address in Shelby County. Born in Methodist Central Hospital. Reared in Central Gardens. Educated first in a small Episcopal school down the street from my house and a graduate of Memphis Central High School. Although my address today is in Germantown, when people ask where I am from I say Memphis. Not Germantown, not Shelby County, Memphis. And I love Memphis. My daughter and her best friend attend a Shelby County School. They love their school. It has wonderful teachers, a strong administrative staff, lots of activities and highly involved parents. It’s the kind of school I wish for all students in the community. Unfortunately, not everyone has a school like ours and they should. We have an opportunity today to do what is best for all the children by working together for the future. No one has all the answers so set aside your fears and listen. To those in the county, Memphis is not a scary place to be feared. Crime exists in every metropolitan area, not just Memphis. You are missing out on the cool funky vibe of Memphis and the best and warmest people if you’ve never been inside the loop. There are children there who need your attention and time. To those in the City, many who live in the suburbs are transplants to this area. When they moved here, they trusted a real estate agent to put them in a nice home with good schools. And like a good real estate agent, they put them in the county because it’s an easy sell. So give them a break, they have never had the opportunity to really know Memphis. Show them why this city is referred to as the City of Good Abode. There has never been a better opportunity to embrace all our children. Let’s use this time not to tear each other down with hateful words and misplaced assumptions but to get to know one another and find the best in all of us to help our children. Because they don’t know our history, they don’t know state law, and they don’t really care. They deserve our best. Let’s give it to them. Wonderful story and insight – thanks for sharing. Thanks, Martha. I really appreciate your comment. Nicely written Alys. I really have high hopes for the outcome. As an MCS parent, I shouldn’t have to sleep outside the BOE to get my children into a great elementary school. All 122 of them should be great and filled with superior teachers, dynamic administrators and supported by the families and communities around them. I want the best education for my children and I want them to grow up in a city like Memphis where leaders and contributors are being formed in those very schools. All the children of Memphis and Shelby County are our children. We should all want the very best for them. I’m with you Seth! Thanks for your comment. Bless you. I’m a Memphian who started out at Raleigh-Egypt, went private, then finished up out of state. Unlike most Memphians, moving away cemented my desire to be in this city- I couldn’t wait to get back. Now, my son is in first grade in MCS. I love his school, I love my city. Thank you for your perspective- it makes me absolutely crazy when people assume that everyone in the county is racist- I’ve been repeating your transplant/realtor story to everyone who will listen. We will either rise together or fall together, one or the other. It seems to me that it’s our choice to make. Thanks so much Melissa. I am really hopeful for the future. Very well written and aptly titled. I wish we could see more through the eyes of our children. My own state of New Jersey is in a educational uproar. I am left to wonder if anything that is being done is in the best interest of the children. I bet you have a great community that will one day turn out great folks who will fight to preserve it just as you are today!! Thanks Lori! I didn’t think this would mean much to anyone outside of Memphis. While I am sad you are facing similar issues, I am grateful that what I wrote touched you. I am working on a FB group for County residents who support consolidation. My friend Katy Leopard, who is involved with FUSE, has said that this would be helpful (I’m a member of FUSE also). Can you correspond with me at the email above and let me know if you would join and send to 10 friends? Thanks! Thanks Alison, I have joined FUSE and am glad to see a specific group for county residents as well. I’ll be glad to share the group with my friends. The more information people have access to the better.